For the past few years in Dayton I have been able to rely upon my years of pastoral ministry experience with the Spanish speaking in Chile, Arizona and California. In Dayton, I have been involved with the evangelizing process of adolescents, young adults and adults at St. Marys, where the Spanish speaking currently meet. Recently I have been able to introduce the RCIA process to the community which hopefully will help in the spiritual formation of all of us. It is enjoyable to mentor one of the participants of the Archdiocesan Lay Pastoral Ministry Program that is a member of the Spanish speaking community. His goal for the future is to become a deacon. What an asset that will be for the Spanish speaking community in Dayton and the Cincinnati Archdiocese. It has been my privilege to minister with the Spanish speaking most of my life as a Sister of the Precious Blood. To become part of their communities through integration with their families, faith and culture has been an enriching process for which I daily give thanks. After being inserted in the Chilean reality for 11 years, on my return I ministered in Immaculate Heart of Mary parish which borders Arizona with Mexico. How eager the farmworkers were to live their Catholic faith, grow in it and serve the community. The last years there I became the first resident pastoral minister of our mission in San Luis, the border town. The challenge during these years was to advocate for the Spanish speaking in order that they could become an integral part of the U.S. church. After that I was at Our Lady of the Sacred Heart parish in San Diego where I witnessed that the community of believers of a parish was everyone, no matter of their language, race or culture. What a blessing to minister with the diversity including English, Spanish, and Vietnamese speaking. It was in San Diego that I was involved in faith-based community organizing in the local SDOP (San Diego Organizing Project). 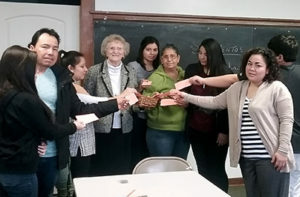 As the Parish Coordinator for the Spanish speaking I learned many valuable techniques from SDOP that helped transform not only the parish but the entire community of San Diego. With this rich experience in ministering with a diverse community I moved to San Bernardino Diocese where I was appointed Pastoral Coordinator by the Bishop. During my time there I ministered in the parishes of Our Lady of Fatima, St. Bernardine and Holy Angels with priests on the parish team as Sacramental Ministers. Again, the parishioners were from many backgrounds of language, ethnicity and race but we learned that we could form a community through communication with one another, making the diversity a blessing instead of a stumbling block. After these parish experiences I was called to congregational leadership in which I used much of my pastoral and language expertise. During that time and now, I continue to be involved in the vocation and formation endeavors of the community. I am grateful to be a member of this congregation, being a reconciling, life-giving presence.